Many types of loads that are temporarily or mainly disconnected (standby mode) must function reliably when needed. This applies, for example, to fire pumps, slide-valve drives, lift motors or emergency power generators. However, during prolonged downtimes, ground faults may occur at the supply line or at the load itself due to humidity or other impacts. 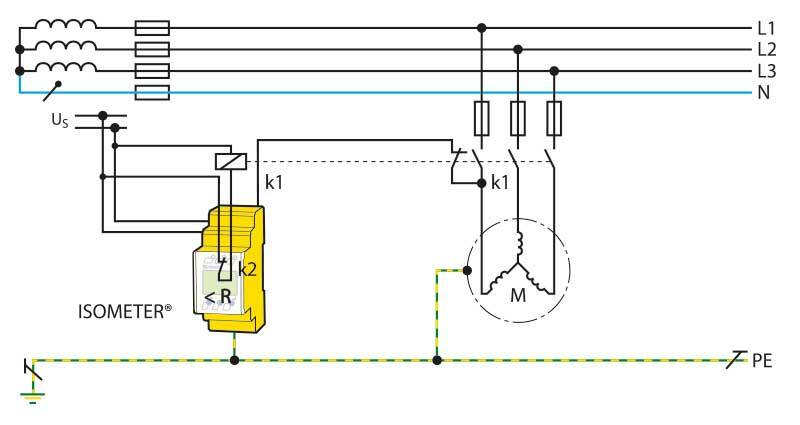 If these ground faults are not detected, when connecting the installation the protective device triggers and operation is not possible. In more severe cases, engine fires may occur. "Offline monitors" can prevent this since they monitor the insulation resistance of de-energized loads in order to report faults at an early stage. Special ISOMETER®s (IR420-D6, IR425-D6, IRDH, iso685 series) are used for this purpose. For this solution it is irrelevant whether the temporarily or mainly disconnected loads are supplied by TN, TT or IT systems. Shortly you will find seminars here.